This open plan building has a 25-seater table and a large open fire. Suitable for an extended family, 2-3 families or special interest groups (20 beds with additional mattresses). Mattresses can ziplock to form 7 queensize beds. The A-Frame has a large gas stove, microwave, kettle, toaster, urn, CD player, washing machine, log fire, cot, high chair, BBQ, games, books and child-proofing. Linen provided. 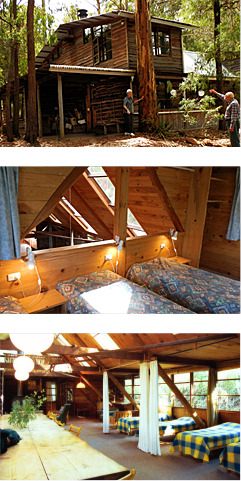 School hols & long w/ends: $375/night for 4 people (min. 3 nights). Extra people: adult $25, child $15/night.